When my parents began writing life stories in their writing group, I figured a few good stories would make it onto paper. Well, they did followed by many, many more than I ever imagined. The family history that emerged makes for exciting and revelatory reading. From the family roots in Scotland and England, to the shores of Connecticut, then westward to Indiana, the family grew and flourished. 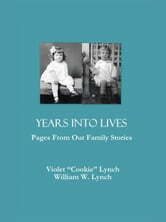 The adventures and travels of the Lynch and Cook families span World Wars, cross thousands of miles, and yielded hundreds of photographs. This book will captivate you with its fascinating twists and turns, and with its tales of love and devotion. It is, indeed, a feast of a book.